This week marks ten years since Kaspersky Lab reported the discovery of Cabir – the first ever worm designed to attack mobile phones. 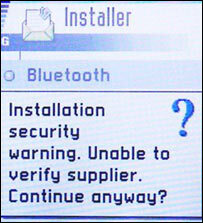 Ten years ago, Kaspersky Lab reported the discovery of Cabir – the first ever worm designed to attack mobile phones. Unlike most modern malware samples, Cabir wasn’t equipped with a wide range of malicious functions. Instead it made history by proving that it was possible to infect mobile phones. Cabir was infecting Symbian-powered Nokia devices by spreading via unsecured Bluetooth connections. With its discovery the world learned that there was now malware not just for computers – which everyone already knew too well about (save for the odd hermit or monk) – but also for smartphones. Yes, many were scratching their heads at first – “viruses infecting my phone? Yeah, pull the other leg” – but the simple truth of the matter did finally sink in sooner (= months) or later (= years a decade!) for most people (some still aren’t aware). Cabir was just a beginning, a starting point. Soon after discovered, it was clear that mobile threats are a very serious problem which need a very special approach. After Cabir, a few hundred different viruses targeting Symbian devices were discovered. The number of new malware samples for this platform started to decline rapidly after the establishment of new mobile operating systems, such as Android, which grew to be more widespread and thus more lucrative for cybercriminals. Ten years after the discovery of Cabir, Kaspersky Lab’s collection of mobile malware contains more than 340,000 unique samples, with more than 99% targeting Android.